Young people are being warned that faddy diets are putting their health at risk. The National Osteoporosis Society found that a fifth of under-25s were cutting out or reducing dairy in their diet, which can affect their bones. One diet that - in its extreme form - recommends avoiding dairy is "clean eating". The idea is to only eat "clean" foods by cooking from scratch, choosing foods in their natural state, and eliminating refined sugar. More extreme versions might exclude gluten, grains, dairy - or even encourage a raw food diet. Pippa Selby, a clean eater for three years, starts the day with a bowl of smoothie, frozen fruit, fresh fruit, oats and a nut butter. Lunch might be a homemade soup or a mozzarella salad. For dinner a sweet potato bake or grass-fed, free range meat and homemade chips. Other clean-eating classics are the kale smoothie, smashed avocado, chia seeds and quinoa. It's been around for about a decade, says dietician Catherine Collins. A-list celebrities Gwyneth Paltrow, Katy Perry, Miranda Kerr and Jessica Alba are all reportedly fans. But it's foodie vloggers and bloggers who have given the concept wings. Clean Eating Alice, also known as Alice Liveing, has half a million Instagram followers and two cookbooks to her name. In a recent interview with the Sun, she said she chose the term "clean eating" because it "perfectly encapsulated everything I wanted to do to my own diet - clean it up, get rid of a lot of the processed rubbish and begin eating real food again. "I never once thought about restricting whole food groups from my diet, or placing metaphorical labels on foods and seeing them as either clean or unclean." Food blogger Ella Mills - better known as Deliciously Ella - has distanced herself from the "clean-eating" label. In BBC documentary "Clean Eating: The Dirty Truth" she said the word "clean" had become too "loaded". "Clean now implies dirty and that's negative," she said. "When I first read the term, it meant natural, kind of unprocessed, and now it doesn't mean that at all. It means diet. It means fad." It's unclear. Catherine Collins says it's more of a lifestyle choice than a diet, which seems to appeal to teenage girls and women in their 20s. It requires attention to detail and a certain attitude - you won't find many 40-year-old mums with children doing it, she adds. Pippa Selby started clean eating after suffering joint pain and dizzy spells following the birth of her daughter. The 29-year-old picture researcher from east London says it was expensive changing her diet, but it has made a difference to how she feels. Image caption Pippa Selby find she feels better when she "clean-eats"
But there was a point when she had to "step away" from it. "It's easy to become obsessive about it," she says. "It can be so restrictive and there's so much on social media that you can feel under attack if you don't eat the right foods." Collins says the inference of "clean eating" is that a vegetable-based diet will make you slimmer, fitter, more attractive, and make you live longer. But she worries when bloggers recommend cutting out major food groups like dairy and wheat without suggesting an alternative. If you don't look like Miranda Kerr now, says Collins, it's probably not going to happen - her looks are down to good genes, a strict diet and exercise. "Outwardly, you can look vibrant and beautiful, but inwardly your body can be crying out for nutrition," she says. Collins points to Gwyneth Paltrow saying in 2010 she had the early stages of osteopenia, a precursor to the brittle bone disease osteoporosis, usually seen in women after the menopause. Osteopenia can occur when someone cuts out food groups such as dairy, especially if it is a lifelong habit. The most recent National Diet and Nutrition Study found the calcium intake of one in six women under 24 was deemed to be worryingly low. Collins advises young women to think about what's missing from those delicious-looking plates, posted on Instagram by the skinny and beautiful. It's a snapshot of their diet, she says. "There might have been a load of chocolate biscuits and purging in between." The best diet is a varied one, says Collins. 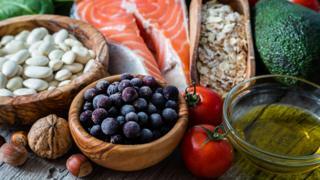 A Mediterranean-style one of olive oil, vegetables, lean meat and a handful of nuts to snack on is a "nutritional blueprint for people of all ages". The more restrictive and the more caveats, the less healthy the diet, she concludes. Is the 10-a-day diet only for the wealthy? Diet debate: Is breakfast a waste of time?